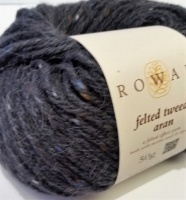 Felted Tweed Aran is a beautifully rustic blend of 50% merino wool, 25% alpaca and 25% viscose. 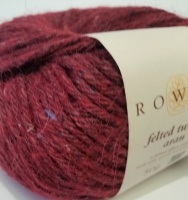 The yarn has a beatiful tweed effect, perfect for fairisles, striping and other colour workand is a good choice for winter projects. The colour palette is comprehensive, with sjades ranging from cool, watery tones, to warming cherry red and fiery ginger. 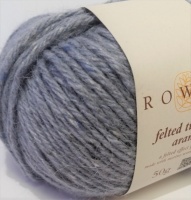 *Please note, this is a light;y pre-felted yarn. Please follow care instructions, as the yarn may felt further if washed incorrectly.